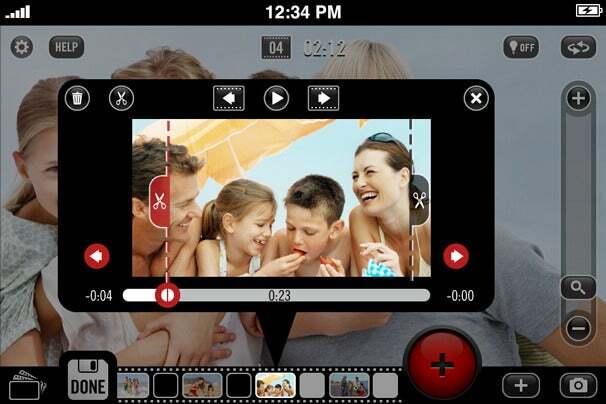 If you ever dreamed of creating quick movies with your iPhone or iPod touch, but didn't know how to get started, or felt intimidated by the process, i4software has a suggestion: its new Video Camera app. Video Camera, which debuted Thursday at Macworld | iWorld, aims to simplify the process of shooting, editing, and sharing video by combining all processes into one unified application. Video Camera lets you shoot your video, edit it, and upload it to various social media outlets. But that's not all. Video Camera's built-in networking capabilities let groups of people share the video recording experience together in one place in real time, and soon, even from far-flung locations in real time. "I always enjoyed making movies, but while shooting was quick, editing became time consuming," said software architect Michael Zaletel, i4software's CEO, and Video Camera's creator. "The concept of combining acquisition and editing is revolutionary." It's also easy, and powerful. Just load the app onto your device, and after launching it, shoot some clips—you can shoot with both the front and rear cameras of recent iPhones, but the app also worked on my 3GS model. When you have the footage you want, you can turn your attention to editing without leaving the app. The app's live, non-linear editing lets you add, rearrange, trim, and delete clips. 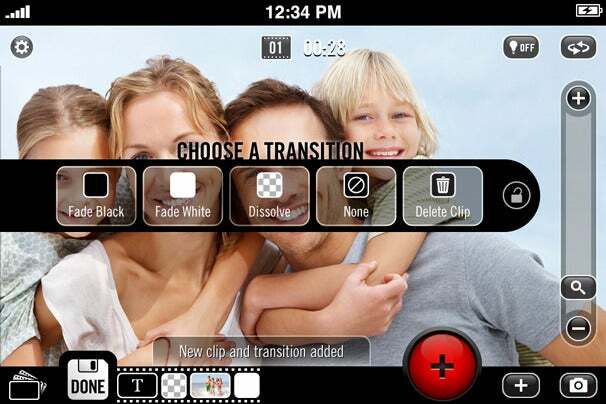 As you choose and trim the clips for your video, the app creates a timeline where you can refine, reorder, and add transitions to your creation. "This is meant to be a seamless process, unchanged from the paradigm of shooting clips," Zalatel said. "It's just more creative. You're playing with the clips and trimming them, and it's all there without having to jump from one environment to another." Video Camera, which works with the iPhone 4 and 4S, fourth generation iPod touch, and iPad 2, lets you shoot HD video in 1080p, 720p, and standard definition. Triple tapping the app's touch screen controls offers more experienced users the ability to control exposure, focus, and white balance, in addition to the app's full zoom control. The app has a rich slate of shooting and editing options to choose from: Auto-record; snapping photos while recording; date and time stamps; the ability to move, duplicate, or delete clips; and using the device's location services to specify location to the credits. It also includes some convenient amenities such as intros, background music, and transition choices. That built-in selection is basic, however, you can choose a background soundtrack from any music you own or purchase from the iTunes store. To give your movies a professional touch, you can add customizable titles and rolling credits. With Video Camera, you aren't confined to shooting video with your phone. Pairing a range of cameras using the iPad Camera Connection kit, you can shoot footage with the GoPro Hero, Panasonic GH1 or GH2, Canon PowerShot S100, 60D, and more, or edit movies that you already have in your camera roll from any source. When you're done with you video—and still within Video Camera—you can upload it to Facebook, YouTube, and Vimeo, in two resolutions. And, of course, you can share it the old-fashioned way—via email. While it can take only 10 minutes for a rank beginner to create a cute little movie, Video Camera's Remote Camera feature builds on the concept of movie-making as a social experience. Employing i4software's patented remote camera technology, groups of up to eight shooters can simultaneously record an event from different angles and combine the scenes together on one device to create multi-dimensional views of an event. The group chooses who will be the Stage—the phone that collects all the videos from the rest of the Players. Each player retains the video they shot, but the Stage gets all the footage from everyone and can, from there, create a movie from the combined shoot. While the Stage/Player function requires all participants to be on the same Wi-Fi network, new server-based functionality will soon allow the same simultaneous shooting and sharing regardless of location. The concept of group shooting stays the same, but the mechanism for sharing the experience in real time extends beyond a single wireless network to encompass wireless and 3G networks linked via a secure server. This new function will be introduced in an update to the program in March, Zaletel says. Video Camera is available now on the iTunes Store for an introductory price of $8.